Bob Lubberman sent me some new photos of our now seemingly resident female Brown Booby. She's recently been spending time further back in the marsh, making land-based views a little less reliable, so we would advise taking a boat trip out there if you really want to see the bird well (check out boat sailing times on our events calendar page or in the Kestrel Express). It looks as though our booby is learning to stick up for herself against those Double-crested Cormorants now! Well, I hate to say I told you so but, I told you so!! Another day without a cold front, but what a day it turned out to be. Regular visitor from the UK, Jonathan Wasse arrived here yesterday and headed to Higbee's Beach for his first morning of birding, only to discover a Black-throated Gray Warbler! 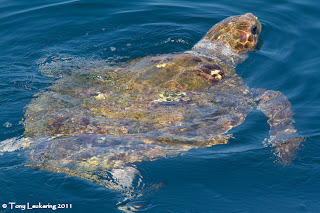 This is a species that should be far away in the Rockies and a wonderful find for Jonathan. Luckily for the rest of us, the bird hung around and was watched on and off over the next couple of hours by a good number of admirers. Other far-western birds of late in New Jersey have included a Townsend's Warbler at Sandy Hook and a Say's Phoebe at Bee Meadow, Hanover. Yesterday, our regular Wednesday morning walk at the state park turned up two American Moorhens - now split from Common Moorhen by some. Unfortunately, some people have chosen to now call the New World bird a Common Gallinule (gallinules are of course in the genus Porphyrula) which is confusing many people and resulting in erroneous records of Purple Gallinule. If only some of the people who make these name-changing decisions for personal reasons could remember that the world doesn't just center around them! Tom Magarian was counter at the Avalon Seawatch on Wednesday and noted a Bridled Tern heading south. 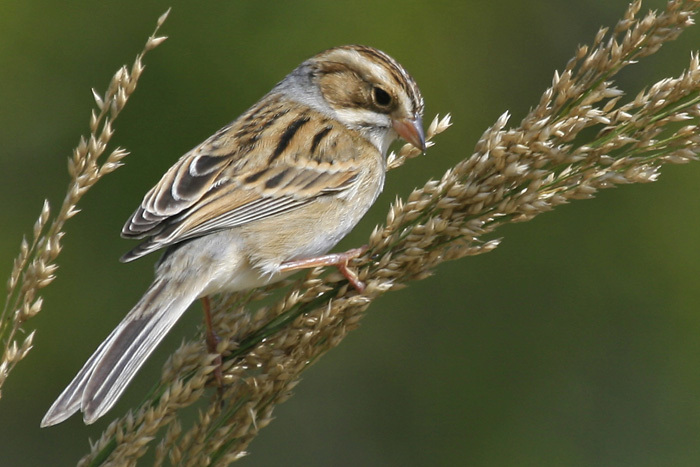 The annual spraying to control Common Reed at The Nature Conservancy's South Cape May Meadows is scheduled to take place next week. The timing of the spraying is weather-dependent so it is not possible at this stage to give exact times when spraying will actually take place. If you intend birding this site next week, please follow any on-site signage you might see on arrival. Nature Conservancy staff are hoping to keep the reserve open as much as possible and will only close sections of the trails if and when spraying is in close proximity. Nature Conservancy staff should be available on site to help you with any questions while spraying is in progress. Note that spraying will not affect Pete Dunne's regular Monday morning walk at The Meadows and hopefully will not affect our Wednesday and Friday evening walks which are likely to take place after spraying has finished for the day. 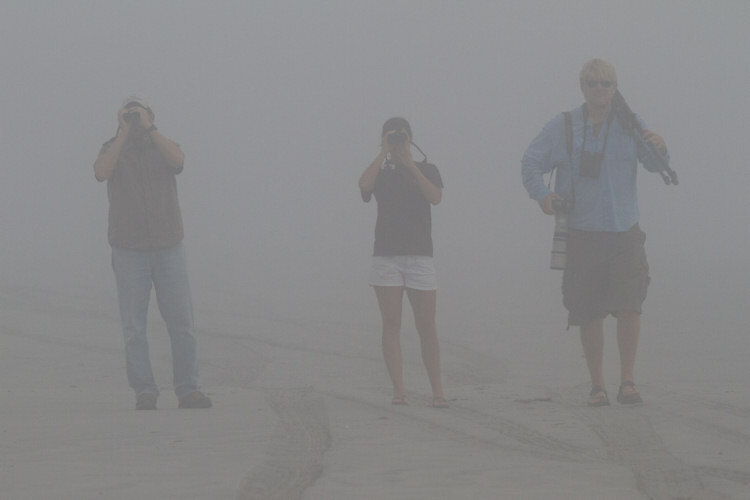 There's a little bit of doom and gloom floating around the local birding community this Fall because the weather is just plain 'wrong'! We all know that NW fronts bring cooler air and birds, but these pesky, persistent southerlies just keep breezing up the eastern seaboard; and the birds? Well they just keep going! Of course, we should be happy for the birds. If we're honest, many migration spectacles actually involve birds being shoe-horned into bottlenecks and appearing before us in large numbers - great for birders but not really that ideal for birds, who would much rather make an uneventful, humdrum flight southward with just the occasional short stop-over to refuel. But hey, this is Cape May; what's with the doom and gloom? I guess we get just a little spoilt here with our regular fall-outs in most years and this year they have certainly been lacking. But Cape May any day can produce good birding - especially in the Fall, when birds are moving whatever the weather. Last night I had occasion to find myself standing out in the street in the middle of town with Michael O'Brien (we're funny like that here!) and the dark skies above were full of all those 'chips', 'squeeks' and 'tsips' that can be heard at Higbee Dike of a morning. 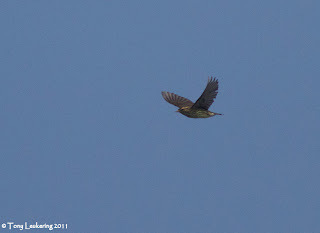 Michael just kept pulling them out of the bag: Green Heron (I knew that one!! 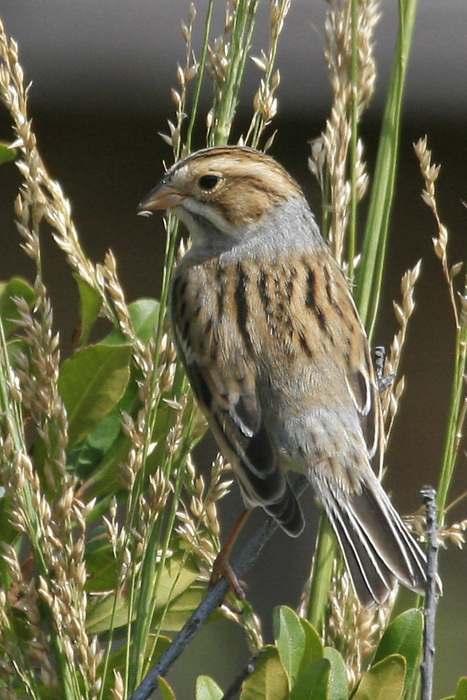 ), Bobolink (and that one! ), Gray-cheeked and Swainson's Thrushes, Veery, Black-throated Blue Warbler, Common Yellowthroat, Rose-breasted Grosbeak, Grasshopper Sparrow (now I'm a wreck! 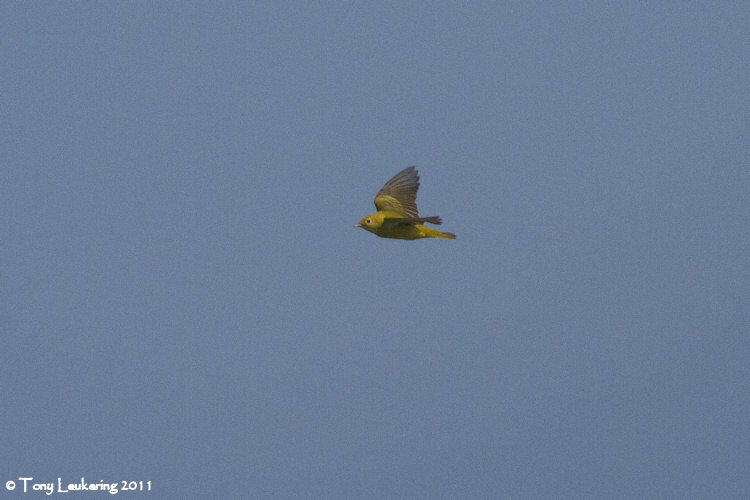 ), Northern Parula, Blackpoll Warbler... and so it went on. 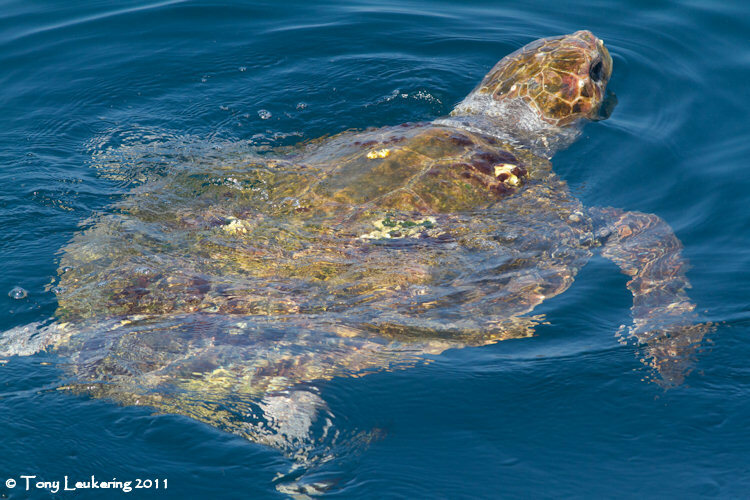 Light southerlies, perfect migration conditions, ¡Buen Viaje Pocitos! Incidentally, if you want to share this amazing experience (and many others too), you may just squeek in on the last couple of places on Michael's Advanced Birding By Ear workshop - click here for some details, or call Chris Tonkinson on 609-861-0700 for an update on availability. 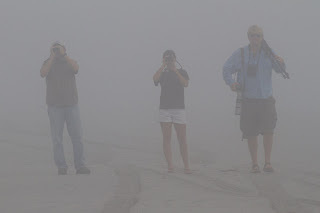 This morning seemed a little quiet after last night's fly-by, but foggy conditions probably accounted for that. The Wilson's Plover was reported continuing at Stone Harbor Point - though at times very hard work at this large site - six Marbled Godwits continue to be seen there and a very obliging Upland Sandpiper spent much of today so far feeding in the first field at Higbee's Beach. Please remember to respect the crop here if you visit. Meanwhile, the whole point seems to be alive with falcons!! Peregrines, Merlins and American Kestrels are having a ball right now and can be seen anywhere from Higbee's and The Beanery to Sunset Boulevard and - of course - the Hawkwatch Platform at the state park. Coming back from my house after a lunchtime visit to Higbee's, I actually counted 12 American Kestrels, four Merlins and a Peregrine along a three mile stretch of road! 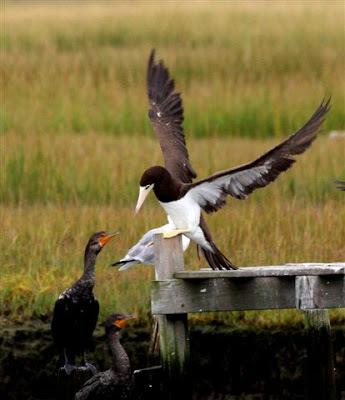 Meanwhile, Mike Fritz reported a fly-by Violet-green Swallow at Stone Harbor Point, Sora Rails are cropping up in The Meadows and a Red-headed Woodpecker appears to be lurking at Cox Hall Creek WMA. 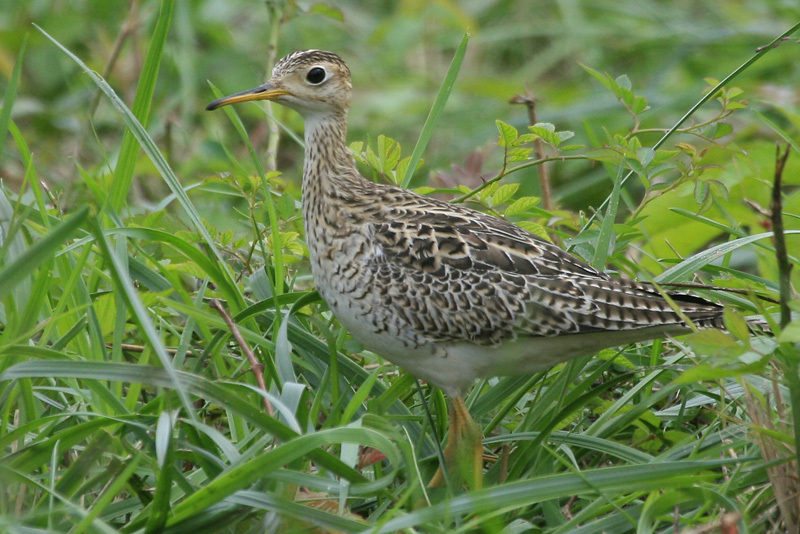 Upland Sandpiper at Higbee's Beach today [photo by Mike Crewe]. These birds can be surprisingly tame on migration; somewhat famously, a vagrant one in the UK a few years back actually took a worm from a birder - who was lying on the ground and holding the worm in his mouth (not recommended!). Just as a little aside; you may wonder what happens to butterflies that survive a hurricane - well here's a good example! 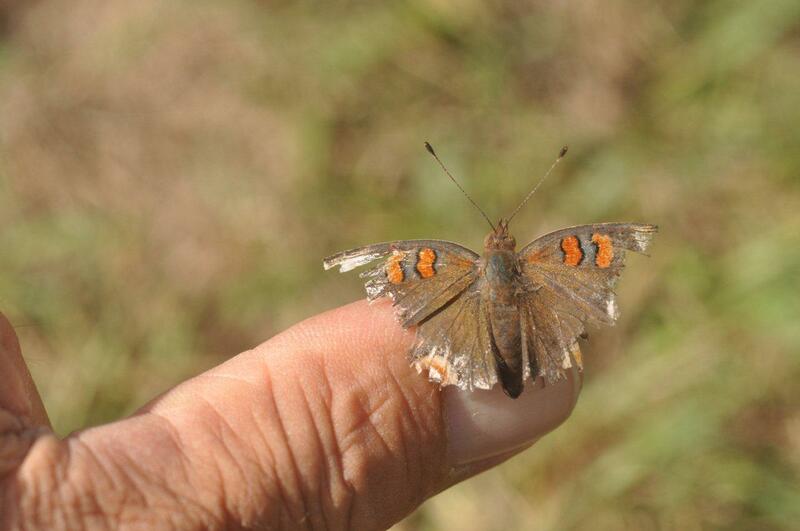 Will Kerling took this photo a few days ago of a seriously battered Common Buckeye. If you want to know what it should look like, compare the picture below with this! One of the stories of the day was the fog. With air temperatures staying fairly stable and high (upper 60s to mid-70s) for what seems like forever (but is only the past week) and with water temperatures having dropped (now in the mid-60s), mostly cloudy to overcast skies, and little to no wind, visibility has been poor to nearly non-existent for the past 40 hours or so. Yesterday's hawk flight was very surprising in its strength -- surprising due to the lack of any appreciable change in macro-scale weather conditions, with large numbers of accipiters and falcons, but Melissa Roach was more than happy to have something to count for a change. Though I haven't heard many details, today's hawk count was considerably slower, though with a good afternoon falcon flight. However, Tom Reed up at the Avalon Seawatch had an abysmal day, with visibility less than a quarter-mile for much of the day and few birds noted during the many, but brief, periods of greater visibility (but with visibility beyond the bell buoy being particularly scarce). However, among his skinny number of birds counted as migrating were four Brown Pelicans (more if any passed after I left). 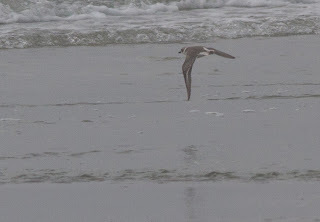 The bird of the day was again the Wilson's Plover that has been a Will-o'-the-wisp for about 10 days, now, at Stone Harbor Point, though we may have figured out why that was so (see below). Vince Elia reported it this morning around 8:45 from farther south on the Point than previous locations. 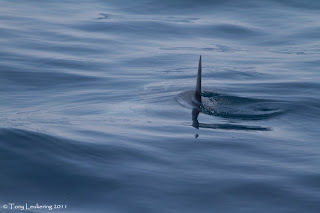 I got the message and, since two trips there on Saturday did not produce a sighting for me, I promptly headed out there. I was greeted there by visibility of less than a few hundred meters, but headed south from the parking lot, anyway. Along the way, a Northern Waterthrush objected to my disturbing it on the path, flying around me and back into the shrubbery. After getting to the beach, the first thing I met was a fly with a buzz... oh, wait, that was somewhere else. 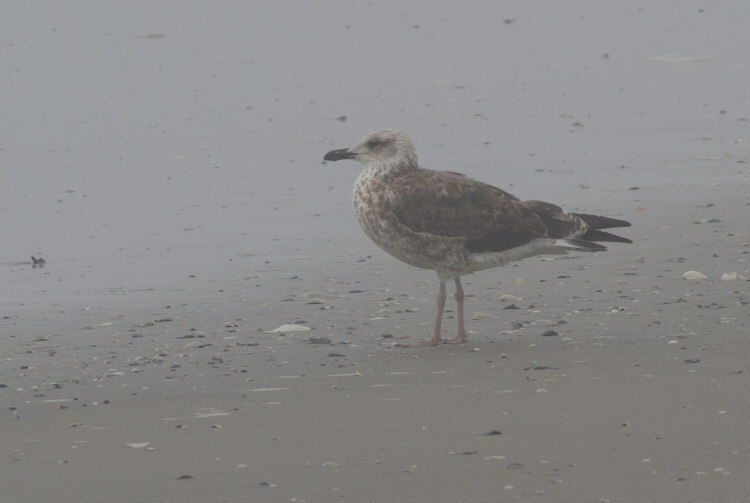 The first thing I met was an adult Lesser Black-backed Gull just south of the jetty in the area of beach at which the Wilson's Plover had been noted on Saturday (along with 30 Semipalmated Plovers and 14 Piping Plovers). 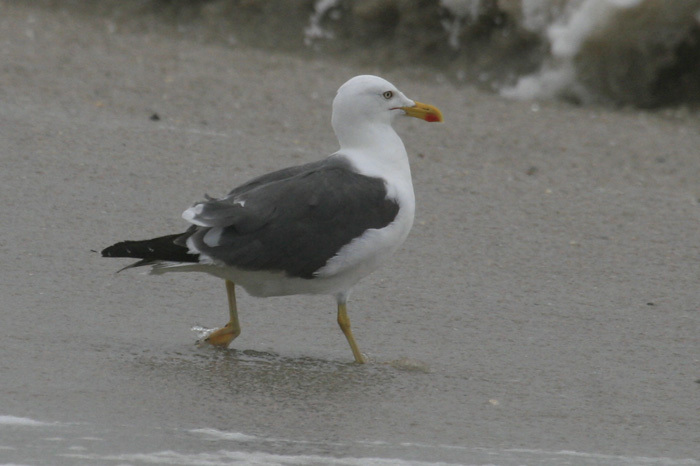 Another Lesser Black-backed Gull, this one a second-cycle bird (~1.25 yrs. old), was a bit farther down the beach on my way south. Michael O'Brien, Melissa Roach, and Tom Johnson were on my trail, though only barely identifiable a few hundred meters away. I waited for them to join me, and we continued our tramp downbeach. Only a short while later, Michael found the Wilson's Plover running across our path, whereupon we all ogled it and then moved closer in hopes of better looks and some photographs. Unfortunately, it then flew off to join a passing flock of Sanderling that was heading south and then west into Hereford Inlet. 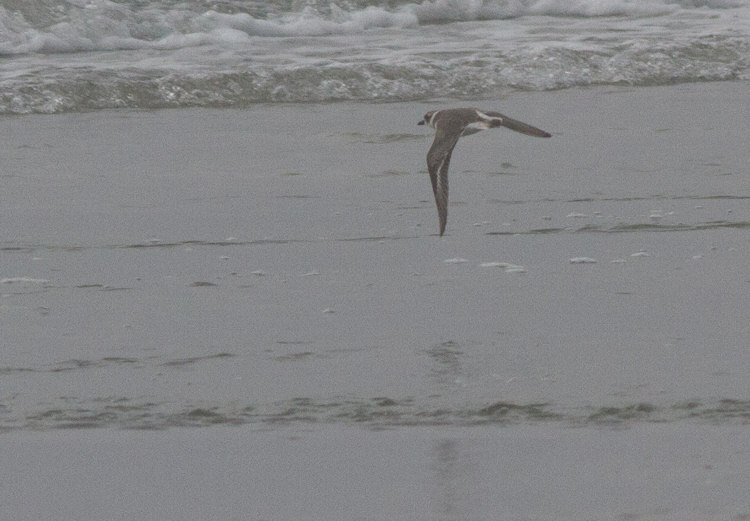 [Wilson's Plover shortly after jumping off the beach on its way to join a passing Sanderling flock. We continued to the end of the point, where we noted that much of Champagne Island was above water and we speculated that the Wilson's Plover might have been so difficult to find because it spent some of its day on the island. Though the island has supported a large tern and skimmer colony in the past (and been much ogled because of it), its current iteration has no vegetation because it is entirely under water at high tide. Because of that, I believe that few birders have scanned it much in the past couple years and we might have gotten out of the habit of thinking about it. But, as noted by Michael (again! ), there was the plover! Unfortunately, again the bird flew off and we lost it to the SE in the fog. However, we still enjoyed the large number of Caspian Terns and Black-bellied Plovers there, along with a smattering of Red Knots and American Oystercatchers, and three adult Lesser Black-backed Gulls. A Wilson's Plover was found at Stone Harbor Point by Don Freiday this morning, just south of the southernmost stone jetties. Though there is fairly regular coverage at this site, it does seem likely that this is the same bird that was reported from there on Sunday, September 11th. I managed to squeeze the bird into a lunch time visit and found Don revelling in some glorious sand and mud as he defied the incoming tide to get some great shots (being in my work apparel, I decided to be a little more cautious with my approach!). The bird was flushed by a shell collector (despite the gathering of people enjoying the bird!!) 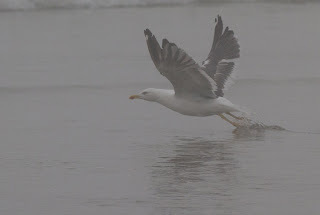 and flew off strongly to the south, but it may well still be in the area and should be looked for along the tideline. Though I didn't make it to Higbee's Beach before work this morning, there may well have been a small movement of birds, as the Northwood Center certainly had warblers first thing, including a Yellow-breasted Chat right outside my office window (a new one for that list!) 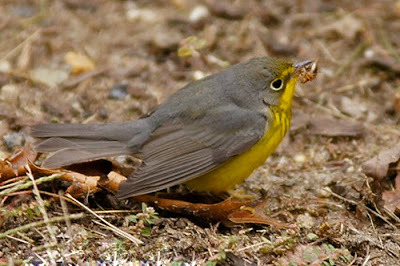 and some visiting birders reported a Mourning Warbler beside Lake Lily, outside the store. 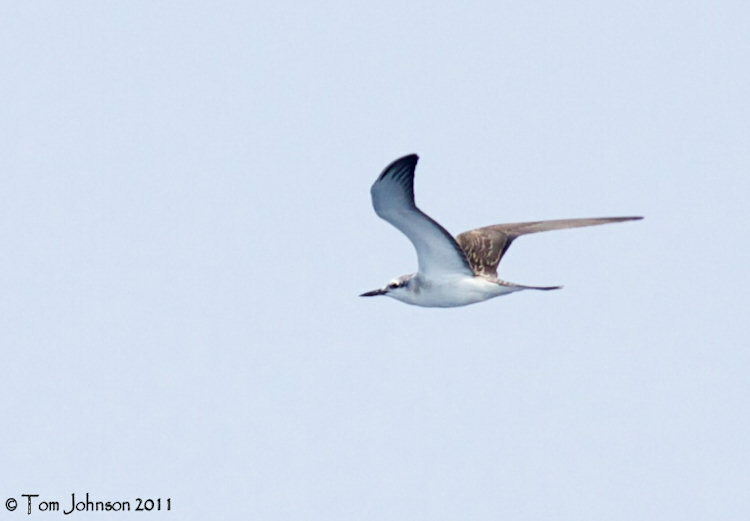 This morning I also heard of a Bonaparte's Gull seen yesterday too. Along the Atlantic coast this morning, Brian Johnson reported a fair movement of Brown Pelicans heading south off Sea Isle City, while our Seawatch counter, Tom Reed, had counted 32 passing Avalon by lunchtime. Oh, and by the way, if you want to know how Tom is doing with his New Jersey 'Big Year' - take a look at the Press of Atlantic City website where he's front page news right now! From the front, the long, dull pink legs of Wilson's Plover seem particularly noticeable [photo by Mike Crewe]. Three in one view! Three Charadrius plover species in one shot is not easy in Cape May County, but here, Piping, Semipalmated and Wilson's Plovers all line up to be counted at Stone Harbor Point [photo by Mike Crewe]. Just a quick request regarding the fields and trails at Higbee's Beach. The first field south of the parking lot has now been planted with a crop of winter rye and the plan is to sow the field with a permanent grass and wildflower mix next spring. This will create a fabulous habitat for migratory birds. PLEASE, PLEASE, PLEASE, make every effort to resist walking on the crop now that plants are germinating in there, and keep to the well-worn trails around the edge of the field. Thanks to all. Soggy weather continues on and off at Cape May today as dreary southerlies slip through the region and persuade migrants to head south by another route. However, such laclustre days always have a little bit of polish on them here and, though some of use such days to catch up on office duties, others are out and about and it is such people who turn up the extra special goodies that are lurking around Cape May at this time of year. 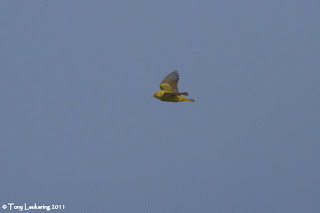 Over the last few days, I've been sent several photos of such birds and even managed to see a couple of things myself! Perhaps one of the most bizarre text messages of late came early on Wednesday morning when Tom Johnson reported two Wild Turkeys, seen in flight from Higbee's Dike! 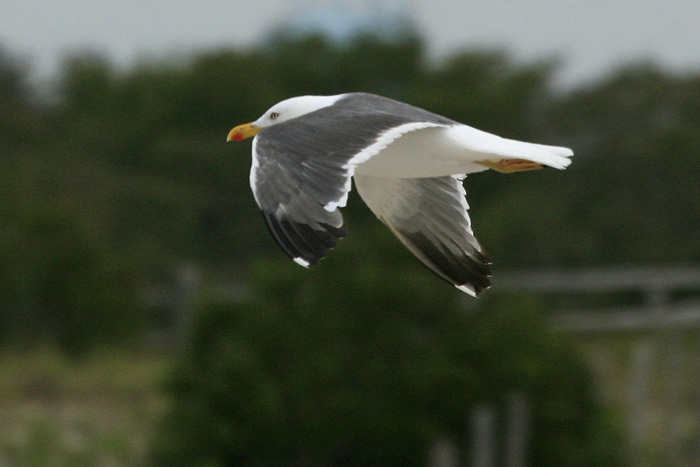 A leucistic Laughing Gull also comes in under the bizarre header - one has been reoprted a couple of times from around the point, most recently at St Mary's on Wednesday. 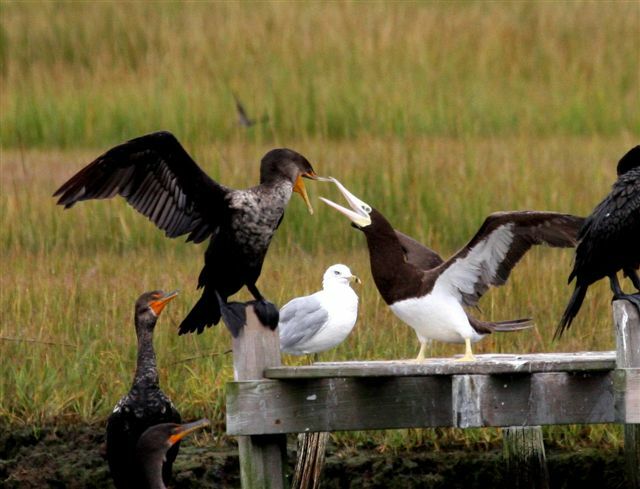 Further afield, Brigantine continues to pull in both birds and birders to watch them, with White Ibis, Hudsonian Godwit and Yellow-headed Blackbird all still being reported this week. 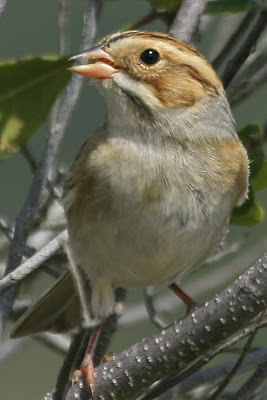 Below are a few photos of some interesing birds from the past few days. Wayne Morley sent me this unusual photo of a Canada Warbler; unusual because this is a bird that normally likes to skulk in the thickets. This bird was on the ground under Wayne's feeder in his yard - very nice! And talking of things coming out into the open; Bob Lubberman sent me this picture of a fabulous American Bittern that disported itself before the folks on our Back Bay Birding By Boat trip today. After the heady weekend of wall to wall birds, it was back to trudging around damp fields by Monday morning in the hope of finding a few things left behind after the big clear out. I mentioned previously that 28 warbler species had been reported on Friday - that number has risen to 31 now, though it does include a late report of a Prothonotary Warbler which I haven't seen pictures of yet... (if you're out there and want to share!). One other update I should mention, the Red-necked Phalarope turned out to be a Red Phalarope - an easy mistake to make with juveniles at this time of year. It sounds as though it was seen again at Sunset Beach on Sunday. Other birds on Sunday included a late Golden-winged Warbler (continuing a good fall for them here) Olive-sided Flycatcher and Summer Tanager at Higbee's Beach and a Lark Sparrow again at Cape May Point State Park. 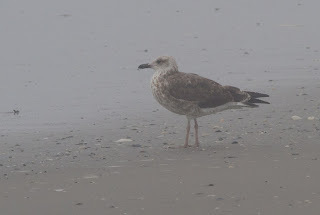 On Monday, a juvenile Red-headed Woodpecker was reported from Cox Hall Creek WMA and a single Sandwich Tern showed up again at South Cape May Beach. Most of us missed 'the big one' from the past few days it seems, however, as Tom Johnson pulled a Violet-green Swallow out of the hat a little after 4:30PM on Monday. A real vagrant from the far west, this is never an easy call when you're talking about juveniles, but the photos show all the features nicely, including a pale underwing, some white above the eye and - of course - the classic white rump patch with narrow, dark center. Not much has been on offer under gray skies today, save for the Eurasian Collared Dove that flew past Higbee Dike this morning (are there now five on the island?! ), but the Brown Booby continues her lonely vigil in Jarvis Sound I hear, and a light shower this afternoon saw me nipping out to check Lighthouse Pond, where there was no sign of the hoped-for Violet-green Swallow, but some 30 or more Tree Swallows, 10 Barn Swallows, four Chimney Swifts and 11 Purple Martins were shortly joined by at least two Bank Swallows and two Cliff Swallows. Yes, it's been a week, but I am finally getting around to summarizing the pelagic trip that a large number of the Cape May regulars enjoyed on Sunday, 11 September. 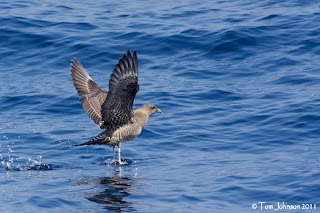 Thanks to the crew of the Atlantic Star for their efforts in enabling us to find interesting birds and in greatly enjoying the non-avian show the sea provided us. Also, tremendous thanks are owed Tom Reed for doing the vast majority of the organizing of the event after it became clear to me that my various and sundry writing commitments would not allow me the time to do so. We departed around midnight from Wildwood Crest, passing right by channel marker #475 enabling us to briefly ogle the adult female Brown Booby that has squatting rights there. On most any other pelagic trip off New Jersey, Brown Booby would probably have been the highlight of the trip and we hadn't yet gotten out of the back bays! First light saw us on Wilmington Canyon, with a spreading slick of oil and fish bits awaiting the first birds of the morning. 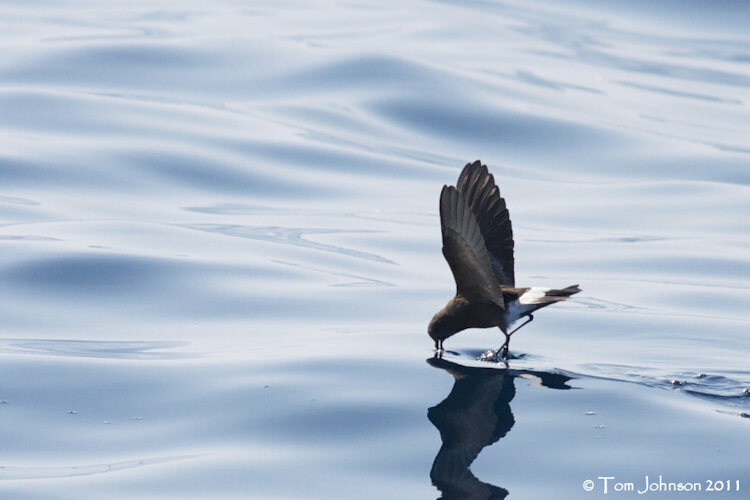 As per usual out there at the appropriate season, Wilson's Storm-Petrel was first and as the light got stronger, the many photographers on the boat began taking aim. Such close good views enabled all to even note the yellow webbing on the feet of the storm-petrels! 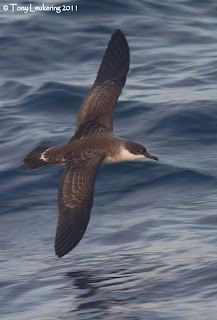 Great Shearwaters came into the slick, too, providing numerous excellent photo ops immediately behind the boat. A smattering of Cory's Shearwaters made appearances, but none came in close. 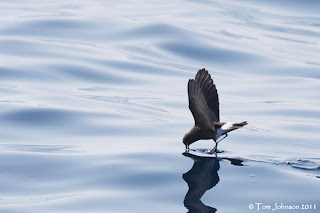 We finally left the slick behind, and struck out for a temperature break (abrupt change in temperature of different water masses; in this case from 73 degrees to 76 degrees), a feature to which White-faced Storm-Petrel is attracted. 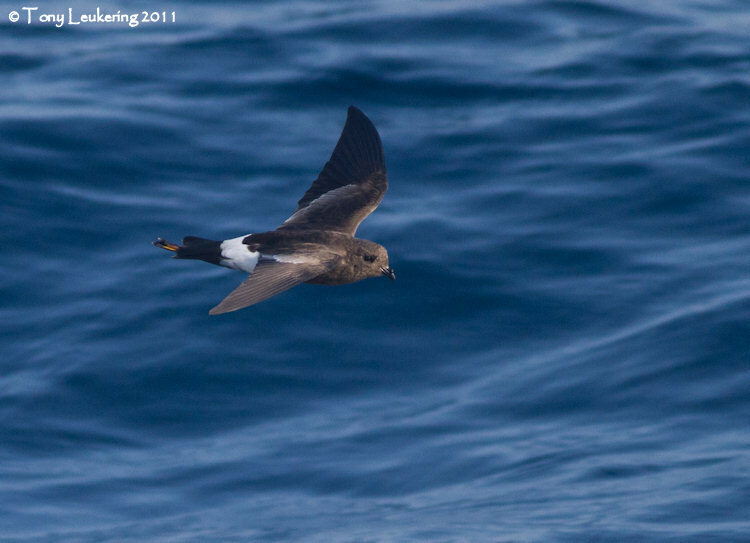 Though we worked this break for quite a while both in the morning and the afternoon, we went unrewarded with what may be the Holy Grail of storm-petrels. 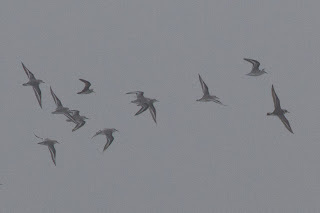 However, once we got into the warmer water, we were rewarded with a flock of six Bridled Terns, most of which were young-of-the-year (as below). We would end the day with 10 Bridleds. 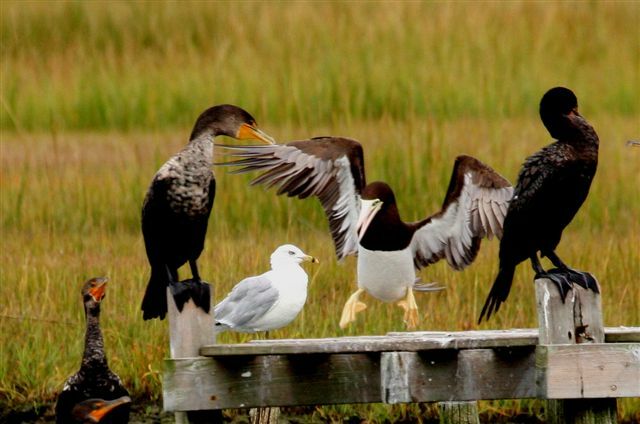 And, now, for a quick aside about landbirds. With the overnight winds being light and from the east, we did not expect much in the way of landbirds, and were not disabused of that expectation. However, the photographers certainly appreciated the few warblers noted, as they provided much better photo ops than one typically gets at the Higbees dike, being longer in duration and more predictable in flight path. Not predictable, just more predictable. I think that the landbird flight was comprised solely of one Northern Waterthrush, one Yellow Warbler, one Common Yellowthroat (an imm. 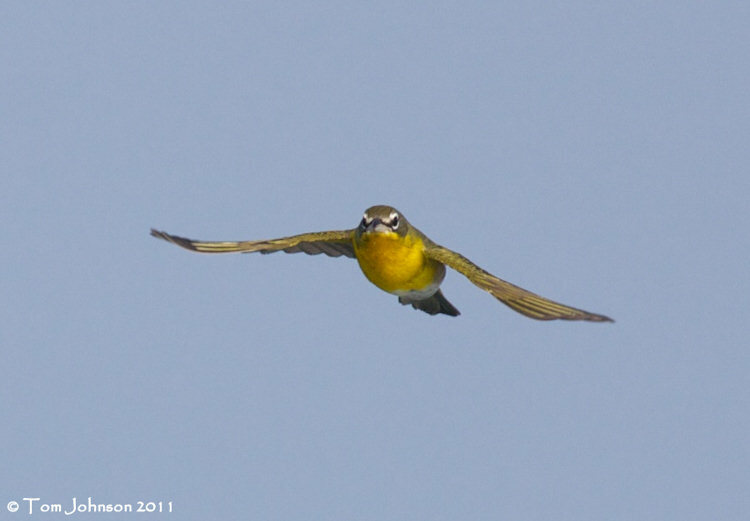 male), and two Yellow-breasted Chats (one female, one male). 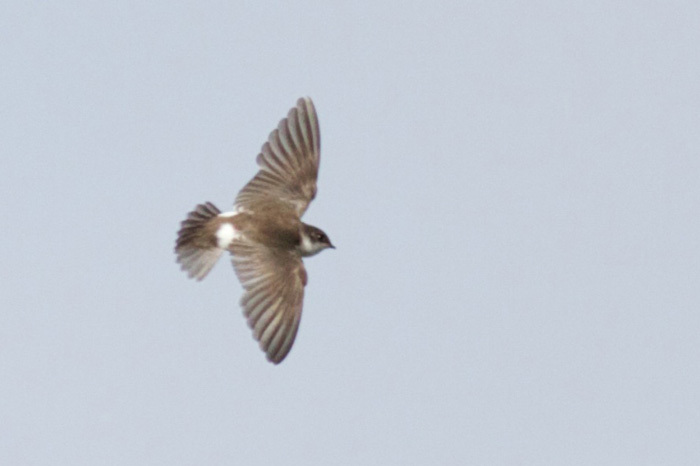 The latter two species were particularly appreciated, as neither species takes part in morning flight, so photo ops for the two in flight are fairly scarce. 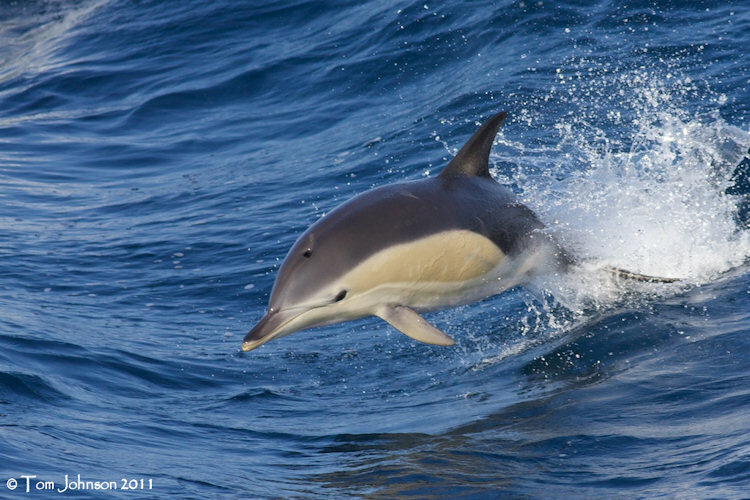 Our first marine-mammal experience of the day would be the most interesting and most fun! 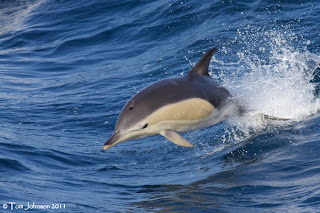 Off in the distance, we noted a large pod (>350 animals) of Short-beaked Common Dolphins, so motored our way toward them. And, so typical of the species, once the dolphins noticed the boat, they motored, er... finned their way toward it. 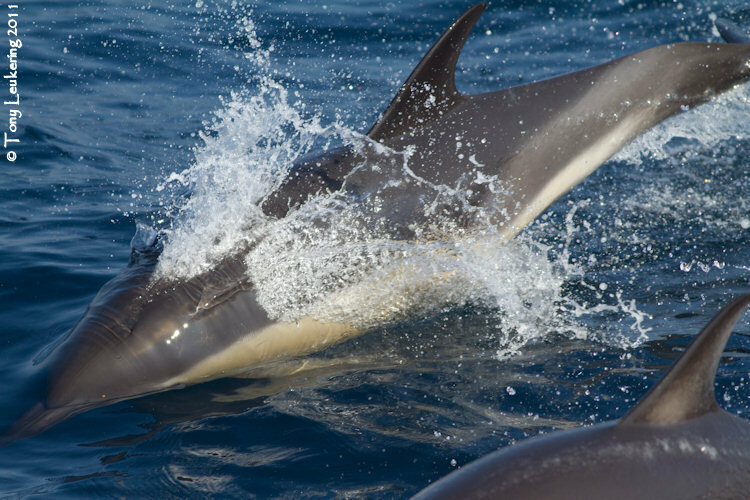 Our captain (Chris Kanya) kept the boat at speed so that the dolphins would be able to bow ride, but also turned large circles enabling the dolphins to ride the wake, providing entertainment not only for the land-lubber mammals present, but also for the dolphins. Watching them cavort on the bow and in the wake, it is impossible to not believe that they were having fun. Particularly, as they left a large fish boil on which they'd been feeding in order to do so. 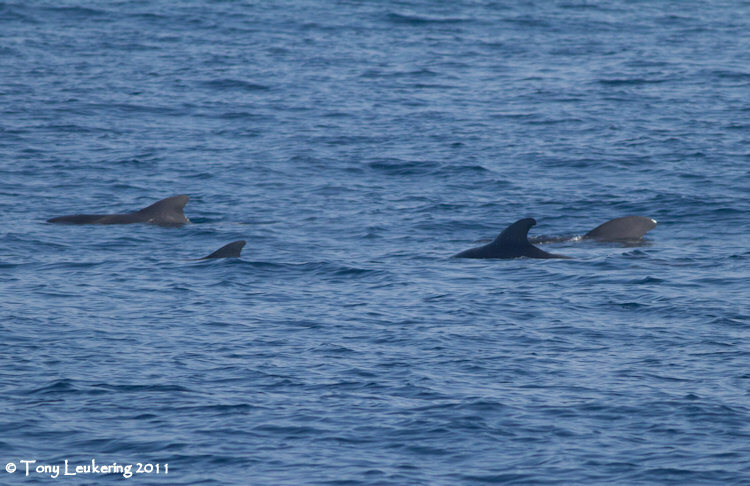 In the deep water (>1300 feet) we ran across a couple pods of pilot whales (either Short-finned or Long-finned), many of which were lounging about the surface. 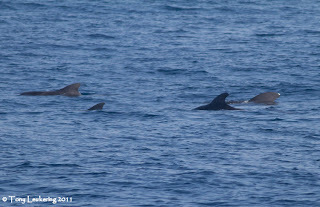 While ogling them, three Minke Whales were seen fairly well as they travelled by. A will-o'-the-wisp large fin went through a tortuous ID process going through shark and ray before finally settling firmly on Ocean Sunfish (Mola mola), a very odd species that typically spends its time at the surface, feeds on jellyfish, and is the largest species of bony fish in the world (adults regularly exceed 2200 lbs). 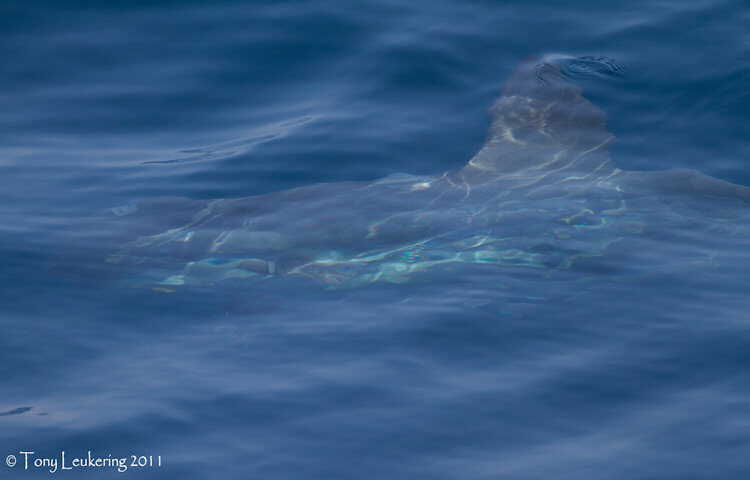 A bit before noon, we started the long run in to shore (advertised return time of 6 pm), leaving the deep water and zig-zagging across Wilmington Canyon in hopes of finding more of interest. 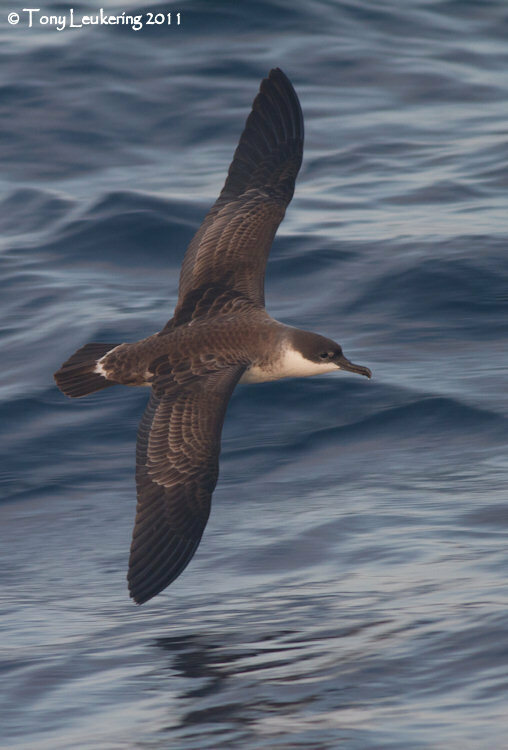 We were not disappointed, and the highlight was the dark juvenile Long-tailed Jaeger that put on a good show, but did not allow close approach. We still do not know what was projecting from its mouth. 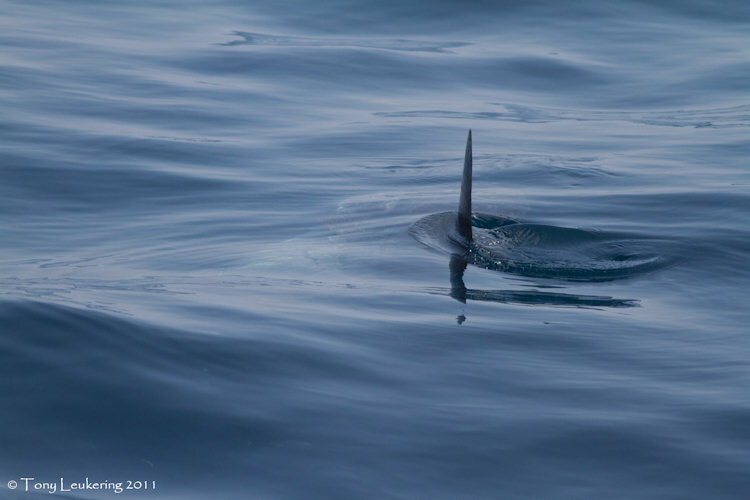 ... while this "friendly" individual was so close to the boat that I could not keep the whole critter in the field of view, and this picture represents the entire field of view at the time! All in all, a lovely day, with nicely calm seas, a good smattering of birds, and an incredible show put on by fish, reptiles, and mammals. "There's a Parula in my Christmas Tree..."
Another Cape May Fall Saturday; a crowded Higbee's Beach parking lot, lots of smiling faces and wall to wall birds. What more could you want? Despite some miserable weather today, with cloudy conditions turning to rain in the afternoon, everyone I spoke to today was having a great day. And the reason? Well, there was a nice continuation of yesterday going on, with warblers all over the place and a nice collection of other goodies too. Higbee's was alive with Northern Parulas, American Redstarts and Red-eyed Vireos today, as well as some nice bonus birds, which included at least 10 Rose-breasted Grosbeaks, five Scarlet Tanagers and both Yellow-billed and Black-billed Cuckoos. Up at Del Haven, a wander of the local streets provided an adult male Hooded Warbler. I heard today of another one of those at the Northwood Center yesterday, so that makes 29 species of warbler for Friday now. Particularly noteworthy today were the vireos, especially Philadelphia Vireo. My own personal tally included Philadelphia, Red-eyed, White-eyed, Blue-headed and Warbling Vireos today - making six species seen in the last two days if you add in Friday's Yellow-throated Vireo! Gorgeous Black-throated Blue and Black-throated Green Warblers and more subtle, fall-plumaged Cape May, Blackburnian, Blackpoll and Bay-breasted Warblers were all enjoyed by many today. More unusual birds during the day included a Lark Sparrow at Cape May Point State Park and a Red-necked Phalarope seen briefly on South Cape May Beach with Sanderlings. There was also a juvenile Red Knot there - not a common bird south of the canal. 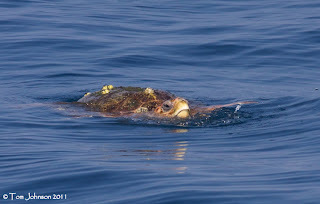 Offshore, The Rips were "heaving" according to Tony Leukering and several Parasitic Jaegers and Brown Pelicans were noted. Black-billed Cuckoo at Higbee's Beach today. Many members of the cuckoo family having energy-saving thermoregulatory behavior and often lose heat overnight. This often means that, after a cool night, they will sit up in the sun to warm up before going about their day's business. We can use this behavior to our advantage by looking for cuckoos early in the morning wherever there are sheltered, sunny spots with exposed branches [photo by Mike Crewe]. 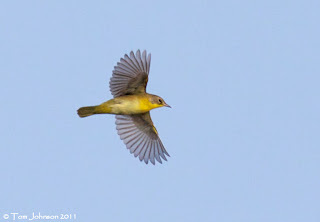 It was a great day for Philadelphia Vireos today [photo by Mike Crewe]. Peeping Parula. It was a fabulous day for watching Northern Parulas today and this picture sums the species up for me - a little gem of a bird that actively peeps around the leaves, looking for tasty insects [photo by Mike Crewe]. Fall arrived today! It's official, just ask anyone who was at Cape May today - the birds were dripping from the trees (and the marshes and the skies...). A slight element of skepticism surrounded the Thursday night get together as there was a small measure of uncertainty as to weather the hoped-for cold front would really come. Waking up this morning I checked the thermometer - 48F. 48F!! After soaring temperatures for what had seemed like an eternity, jackets were finally required this morning, but what a day it turned out to be! Blustery winds caused birds to be a little skittish first thing, but the same blustery winds were probably also responsible for birds being in a hurry to make landfall and Cape May Point itself benefited from the fact that birds seemed in no hurry to head further north before settling down. The stars throughout the whole day today were the warblers - and what a show they put on. From Cox Hall Creek and Higbee's Beach to the State Park and CMBO's Northwood Center, I heard of 27 species of warbler being reported today - of which I managed 23! 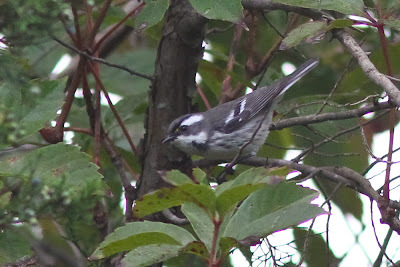 Some of the highlights included a female Cerulean Warbler at the state park, multiple Black-throated Green and Wilson's Warblers, at least five Connecticut Warblers (including two at Hidden Valley and one in our garden! ), a female Golden-winged Warbler at the dike and several Cape May Warblers. As well as the expected dominance in numbers of Black-and-white Warblers, American Redstarts and Northern Parulas, Black-throated Blue Warblers were notable by their presence, with Higbee Dike and the State Park in particular being favored by them. Yellow-throated and Warbling Vireos joined the expected White-eyed and Red-eyeds and multiple Scarlet Tanagers and Rose-breasted Grosbeaks were around. Seven species of flycatcher included a late Acadian at Higbee's, Yellow-bellied at Hidden Valley and an Olive-sided at Cox Hall Creek. A couple of Summer Tanagers were reported (Del Haven and Higbee's), a Dickcissel flew over Hidden Valley and the Hawkwatch had a fair day with Red-shouldered Hawk at Midday and a Swainson's Hawk notched up by counter Melissa Roach in the final half-hour of the count period - just reward for a hard day's work! Brigantine seemed to be quieter today but reports from there included a Yellow-headed Blackbird and a Hudsonian Godwit. If things go according to plan, there should still be a reasonable number of birds on Saturday. Winds are forecast to be NNE which isn't ideal, but it's better than southerlies! Olive-sided Flycatcher at Cox Hall Creek WMA; this site is rapidly gaining a reputation for attracting this species on migration [photo by Mike Crewe]. We seem to have been going through a kind of slow preparation for Fall recently with a definite frustrated edginess to local birders as September continues to muddle along at an all too gentle pace. Despite this, I realise that it has been almost a week since we updated everyone on Cape May sightings - and I see that I have had a fair scattering of text messages during that time. So a quick recap is due. We need to go way back to last Thursday, when an Olive-sided Flycatcher was reported perched near Higbee Dike and an end-of-season Roseate Tern flew west past the point, which brings us then to the birds already mentioned on that busy Friday - an increase in the number of Eurasian Collared Doves to four birds needs to be added to the tally for that day, as well as a late Upland Sandpiper flying over Stevens Street in the evening. Saturday started well with Michael O'Brien reporting overhead calls of up to 150/minute at Cape May Beachfront at 05:30AM and a Golden-winged Warbler was the first report of the day from Higbee's. A Yellow-headed Blackbird flew past the Hawkwatch Platform with Red-winged Blackbirds just after 09:00AM and was followed shortly after by sightings of perhaps a different individual of the species. 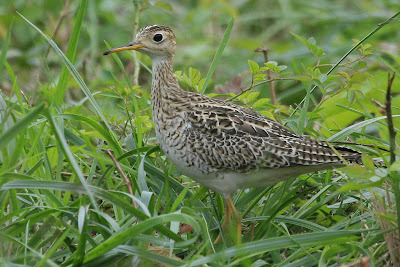 An Upland Sandpiper set the tone for a good Hawkwatch Platform day and Higbee's Beach replied with Connecticut Warbler, Yellow-bellied Flycatcher and Philadelphia and Warbling Vireos. 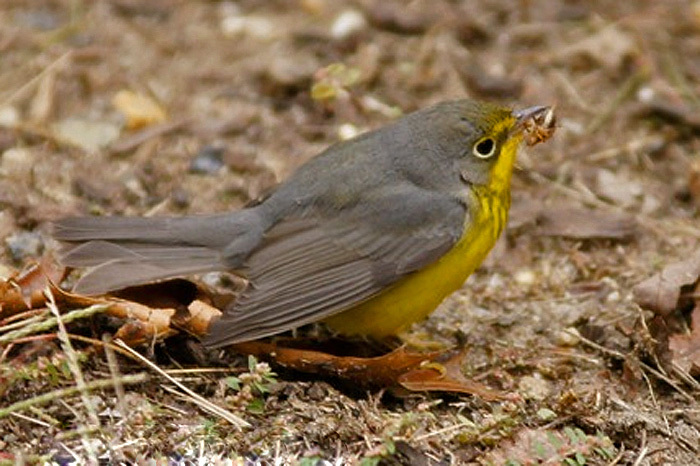 At least two different Wilson's Warblers were also reported from Higbee's. Saturday rounded off with a Mourning Warbler seen all too briefly at Cape May Point State Park. 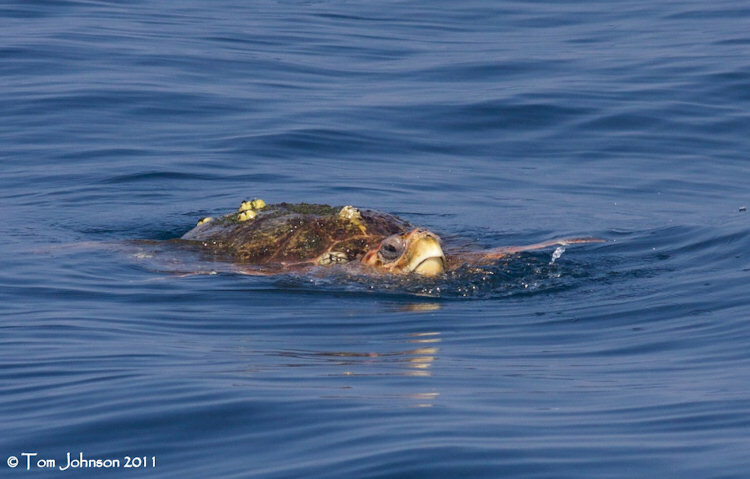 Sunday saw something of a dearth of records from Cape May as many of the local, active birders were away on a pelagic trip out of Wildwood. Highlights that filtered through to me include the Brown Booby (seen on her favorite marker post in the dark as the guys headed out of dock!) 10 or so Bridled Terns, a Long-tailed Jaeger and two Audubon's Shearwaters. Smaller birds - but larger surprises - were two Yellow-breasted Chats which lingered around the boat a while and a Buff-breasted Sandpiper. A further report of a Golden-winged Warbler at Higbee's kicked off Monday morning, then things went kind of quiet until Bob Ringler reported a Wilson's Plover from Stone Harbor. 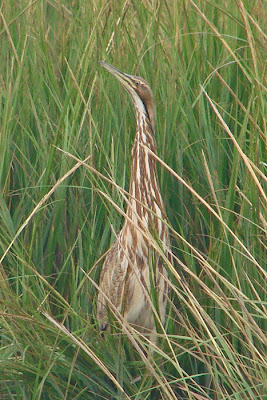 Despite much searching during what was left of the evening and the following morning, no other sightings of this bird were forthcoming. Tuesday began with a good morning flight at Higbee's, with a tolerable distraction for the Morning Flight Counter coming in the shape of a Buff-breasted Sandpiper at the canal impoundment (a great autumn for them continues along the Atlantic seaboard, with high numbers being reported from the UK too!). Reports of a possible Little Egret at Heislerville in Cumberland County were quickly followed up and seem to have unfortunately related to what appeared to be a rather unusual Snowy Egret with dull, grayish lores. Tuesday also produced the first of a run of nice reports from Brigantine over the last few days, starting with a Red-necked Phalarope, immature White Ibis and Black-necked Stilt (all species continue there today). Most intriguing of Tuesday's reports from Brigantine involved a report of 15 American White Pelicans flying over which sadly did not get tracked to Cape May! Our regular Tuesday evening walk wrapped up a busy day nicely with a Lark Sparrow at Stone Harbor Point. Wednesday's opener came from Brigantine with Baird's and Buff-breasted Sandpipers and American Golden Plover reported and a Wilson's Phalarope joined the Red-necked Phalarope that was already there from the day before. Away from birds for a moment, Tony Leukering sent out what appears to be the first report of Cloudless Sulphur for Cape May County for the year, flying past the Hawkwatch Platform. These butterflies move north in late summer and generally by now, we would expect to have had reasonable numbers around for some weeks (Will Kerling reported the second from Cold Spring today). Onward to today (Thursday), and another report of a Yellow-headed Blackbird, this time from Morning Flight counter, Tom Johnson from Higbee Dike. I found time to get out into the field today to get updated on a few of our walk sites and found a great array of birds around Stone Harbor and Nummy's Island. At least 10 Marbled Godwits were present, Caspian Terns - perhaps 15 at least - were feeding in the channels and at least 12 Piping Plovers were still on the beach. A spectacular highlight however, didn't involve birds, but dragonflies. A seemingly endless stream of Green Darners was pouring in off the sea as the wind swung round to the west and tens of thousands appeared to be heading across the point in a broad front. At Nummy's Island, the insects were funneling across the main channel by the free bridge and seemed to be navigating due west along the road. We tried a few one-minute sample counts, simply involving any insects passing us along the width of the road; we arrived at totals of 400-500 per minute passing us in this narrow band - but binoculars revealed insects as far as we could see, until they became too small to see, way out over Stone Harbor Point. Virginia Retig quickly reported a similar phenomenon some 15 miles to the north near mile marker 25 on the Garden State Parkway; again, all were heading west. An incredible sight and something so typical of Cape May. Common Buckeyes were clearly moving south in good numbers today too and, with a big drop in temperature forecast (it's already down to 55F as I type), we may see the first pulse of Monarchs moving through (check out our new Monarch blog to see what's happening!). Wonderful, checker-backed juvenile Sanderlings abound on Cape May beaches at the moment [photo by Mike Crewe]. Any evidence of successful breeding is a step in the right for the western Atlantic Red Knot population, so it is nice to be able to report a scattering of juveniles at Stone Harbor right now [photo by Mike Crewe]. 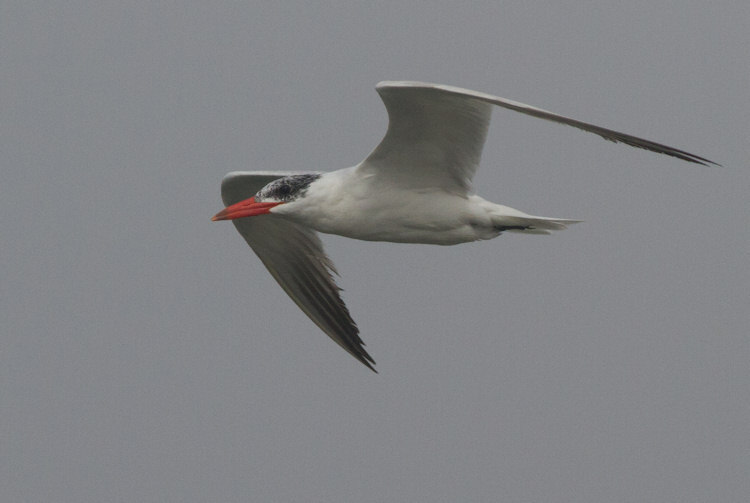 A Caspian Tern gets the green light to cross the bridge at Stone Harbor [photo by Mike Crewe]. Simply awesome! Just a single snapshot in time of the incredible Green Darner migration through Stone Harbor today (click to enlarge) [photo by Mike Crewe]. Beast of the week! This brute of a Snapping Turtle was caught in the open as it ambled across a field at the Rea Farm last Friday [photo by Mike Crewe]. No Weather - But Still Birds!